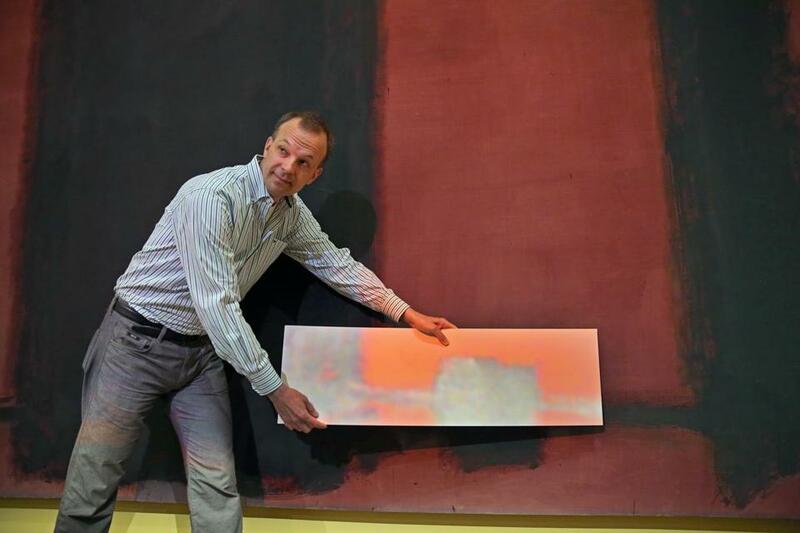 Jens Stenger demonstrated a color difference between a faded Rothko mural and a compensating projection. The five multimillion-dollar murals by famed abstract expressionist Mark Rothko were so faded and damaged by sunlight that Harvard packed them away 35 years ago. Now, a revolutionary invention is being used to bring the original colors back to life, and in the process, sparking debate about artistic integrity. The technique, developed by a team of conservators, curators, and scientists stretching from Cambridge to Switzerland, uses overhead projectors and special software to shine a precision-tinted light on the murals, correcting — pixel-by-pixel — the massive color loss in the murals. The system is being hailed as a technical tour-de-force even by those who oppose using it in this way. And Harvard is expecting a debate. To wit: Is this a welcome way to breathe new life into aging art, or a creepy, Dorian Gray-inspired parlor trick? The public will have ample opportunity to make its own judgment. Harvard Art Museums will show the Rothkos in a new special exhibitions gallery to mark the November completion of its $350 million expansion project. The show is called “Mark Rothko’s Harvard Murals.” His canvasses have fetched more than $50 million per piece in recent years. These paintings were first on display from 1964 to 1979 in the light-soaked penthouse dining room of what is now the Smith Campus Center, an unconventional installation spot. When the light damage became severe, they were packed away into storage. Exhibit organizers, many with a direct connection to the murals, view the show as a second chance. Rothko prepared six canvases for the room, but included only five in the final presentation. The panels are large, nearly 9 feet tall and between 8 and 15 feet wide. Each panel was given a reddish-plum background, but the shapes painted on those canvases — whether roughly square or rectangular or thin bars — were designed with different colors. The decay from the light damage varied. Panel One, for example, retained some of its red, its fading more pronounced on the lower section. Panel Five turned from plum to blue, a dramatic change. Last week, as a sign of how much attention the Rothko show is likely to garner, the Harvard Art Museums opened the gallery in its still unfinished museum to a select group of journalists. The panels were all hanging but only one projector was turned on. That gave Panel Four, faded into purple and grey tones, the reddish look it originally had. Though the exhibition will feature 30 other works, including sketches and canvasses that were studies related to the murals, the main attraction will be the murals. The projection system, unlike the natural light that bathed them at the former Holyoke Center, will not cause further damage to the canvasses. Mary Schneider Enriquez, the associate curator of modern and contemporary art at Harvard Art Museums, gazed at the canvases as journalists milled about. In the 1970s, she was a Harvard undergraduate who made a pilgrimage to the Holyoke Center to see Rothko’s installation. She admits she had some doubts when she first heard of the light project a few years ago. The idea of projecting onto a canvas could bring to mind visions of crude, Hollywood colorization attempts. But Schneider Enriquez says she was “blown away” after seeing the pieces during a test run last year. “To me, this exhibition is both exciting for the reasons the Rothko murals are exciting, but it’s also important when we think about the question of how we take care of things we can’t easily preserve,” said Enriquez. There are already rumblings of dissent. Paul Whitmore, the Director of the Art Conservation Research Center in Yale’s Institute for the Preservation of Cultural Heritage, said he has concerns about the show. Back in 1988, Whitmore was a Harvard Art Museums conservation scientist who helped ready the Rothko works for an exhibition that showed them in their damaged state. Whitmore believes it is a mistake to present the Rothkos with the new system. Gallery visitors are going to believe they are seeing restored paintings and they’re going to want more. Art historian Dore Ashton, author of “About Rothko” and a friend of the artist for years, said that Rothko would probably not be happy about the project. Christopher Rothko, just 6 when his father committed suicide in 1970, said that he’s not surprised by the criticism. He also didn’t quite know what to expect when he came to Harvard, last November, for a demonstration of the system. As for his father’s wishes, Rothko says he doesn’t know what he would think about the projection technology. “I do think he would have been horrified that the paintings ended up in the condition they did,” he said. It was 1960 when Harvard economics professor Wassily Leontief approached Rothko, already famous enough to be getting invitations to the White House, about creating works for the university. The artist eventually settled on the series of panels that ended up installed in what was then called the Holyoke Center. The brightly-lit space immediately posed problems, as did the purpose of the room, for catered functions. The light was an issue. So were the homemade paints, some of them used alongside cans Rothko picked up at a nearby Woolworth’s. In the Holyoke Center, there were even reports of food and drink splattering on the canvases during meals. One Fogg staffer called in a concern about a “disco party” in the space at one point in the ’70s. The damaged panels were displayed in 1988 by Harvard and then returned to storage. That’s where conservation scientists Narayan Khandekar and Jens Stenger examined them years later. Khandekar remembered a lecture he’d attended in London in 1989 presenting the work of a Canadian conservator who had used blue and white light to offset the yellow varnish that had changed the look of an old painting. An idea was born. First, Stenger had to determine the original and correct color of the murals. He then needed somebody to develop the software program to create the projections. MIT Media Lab’s Camera Culture group took that on. Stenger looks up from the book. No one will ever know what Rothko might make of this new intersection of his work and modern technology. But his son, Christopher Rothko, says the beauty of this “restoration” is that his father’s original canvasses have not been physically altered. No touch-up paint. No harmful chemicals.